One of the joys of spending time in Italy is its open-air markets, everything, from the aroma of porchetta to the vibrant colours of sun-ripened produce, feeds the senses as you soak up the atmosphere. 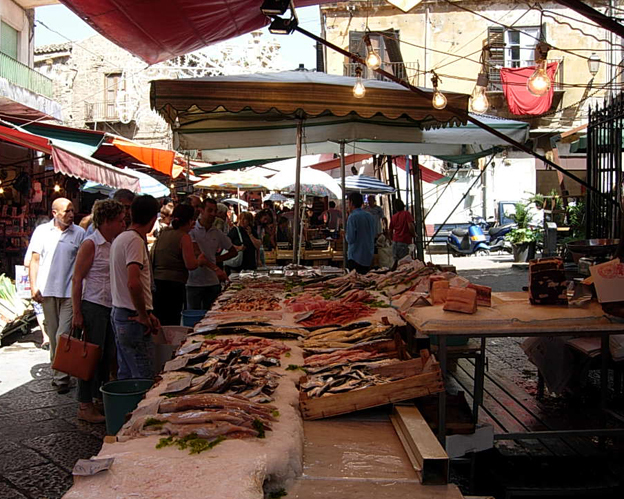 A day at the market is a unique way to observe the day-to-day lifestyle of the locals and, whenever possible, should be included in a tour of the Bel Paese. 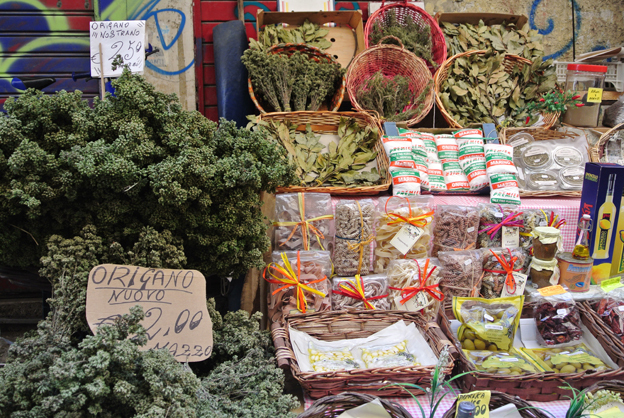 One of Italy’s most visited markets is Sicily’s La Vucciria, which translates to 'voices' or 'hubbub'. Situated in the centro storico and side streets around Piazza San Domenico, it is Palermo's most established outdoor market. From Monday to Saturday, the market opens at 4 a.m., when the fishermen arrive with their catch and the earliest buyers are already waiting. As the other vendors are setting up their stalls, the fishermen are already selling the best of their fish and seafood. The market begins to fill up around 5.30 a.m. By 6 a.m., it’s bustling with shoppers weaving in and out of each other as they navigate around crates of fruit and vegetables that would never pass the E.U. control in Brussels or the big supermarket chains’ requests: here the produce is not uniform in size and shape, sizes may vary, but, being mostly local and fresh from the fields, the quality and taste can be always guaranteed to be sublime. The market dates back 700 years and its past tenuous links with the Mafia have now cooled. The atmosphere remains very interesting, voices are raised as hawkers call out to the shoppers telling them what bargains they have on offer and haggling is all part of the rich history. If you’re looking to stock up your larder, then you’ll find almost everything related to Italian cuisine here: pasta, grains and beans sit cheek by jowl with stalls selling porcini and field mushrooms, and if it’s tomatoes you’re looking for, you’ll have the choice of fresh, pureed and sun-dried, on the vine or in bottles under oil - in fact, any way imaginable. It’s not just foodstuff that is available: the modern scourge of markets has arrived here too, with stalls selling cheap Chinese imports, Padre Pio fridge magnets and plastic toys clutter corners of the sales space squeezed into the maze like streets. But keep a look out for those hidden gems, like a small stall selling wines with the corks tied down and grappa as clear as a mountain spring with an intense flavour that’ll leave you momentarily breathless. For me, it’s the Piazza Caracciolo, where fishermen in aprons are cutting fish on trestle tables balanced precariously on plastic crates as stray cats look on waiting for a chance to steal a morsel that makes for the perfect photographic opportunity - because it’s imperative that upon your visit, you are armed with both a wallet full of cash for spending and camera to capture the riot of colour and boisterous activity that makes the market a great place to visit. There’s a Sicilian expression I love: “Quannu s'asciucanu i balati dà Vucciria,” which means, ‘when the streets of the Vucciria run dry’, meaning, not in this lifetime or in the unforeseeable future. And indeed, let’s hope the Vucciria market will retain its authentic charm and atmosphere for the coming future, as to lose something as unique as this historic market would be unforgivable.